Democratic Senator Elizabeth Warren has finally responded to Donald Trump’s ‘Pocahontas’ jibes with a DNA test proving she has Native American heritage. Rather than silencing the president, her claim to an ancestor between six and ten generations ago will thrill him and provide fresh ammunition for their inevitable clash in the next presidential election. True to form, Trump swiftly labelled the test ‘bogus’ and dismissed Warren’s declaration as a “scam and a lie”. His reaction was predictable, given he questioned Barack Obama’s birthplace back in 2011, and when the former president published his birth certificate, he suggested it could be fraudulent. Trump loves peddling conspiracy theories: while competing with Ted Cruz for the Republican nomination, he claimed the Texas Senator' father was involved in the assassination of President John F. Kennedy in 1963. He also pays zero respect to facts – he recently claimed his “natural instinct for science” makes him sceptical of climate change – and actively twists them to suit his personal agenda. And after failing to show contrition for hundreds of falsehoods and harmful acts, he had the gall to demand Warren apologise for making a claim based on scientific evidence. The Massachusetts Senator must have known Trump – who infamously “punches back 10 times harder” – would mock and reject her claim. Although she explicitly avoided claiming tribal membership, a Cherokee leader also damned her assertion, arguing that the use of a DNA test to align oneself to a tribal nation is “inappropriate and wrong”. Warren has stretched the truth in the past, listing herself as “Cherokee” in a Native American cookbook and identifying herself as a minority in a law school directory. However, there’s no evidence she used her background to get hired as a law professor. It's more likely that she allowed an old family story to get out of hand. Other than satisfying her personal curiosity, there’s an obvious reason why Warren decided to brave Republican ridicule: she wanted to address a lingering issue before launching her presidential campaign. Concrete proof of her heritage will allow her to bat off accusations that she misrepresented herself as a minority to advance her career. However, Trump will undoubtedly deploy the ‘Pocahontas’ moniker with increased fervour now, and accuse Warren of disrespecting Native Americans and defrauding voters. 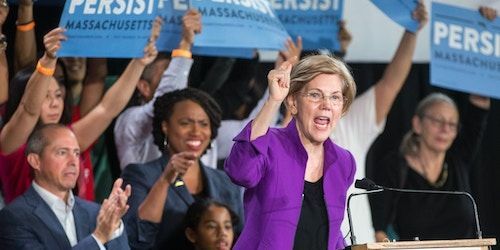 Warren has said “this isn’t just about casual racism, war whoops, tomahawk chops”, but it could be if Trump stoops to previous lows. He will delight in detailing how she’s taken liberties with her distant ancestry or deny it entirely. Warren’s path to the presidency may have just gotten harder.